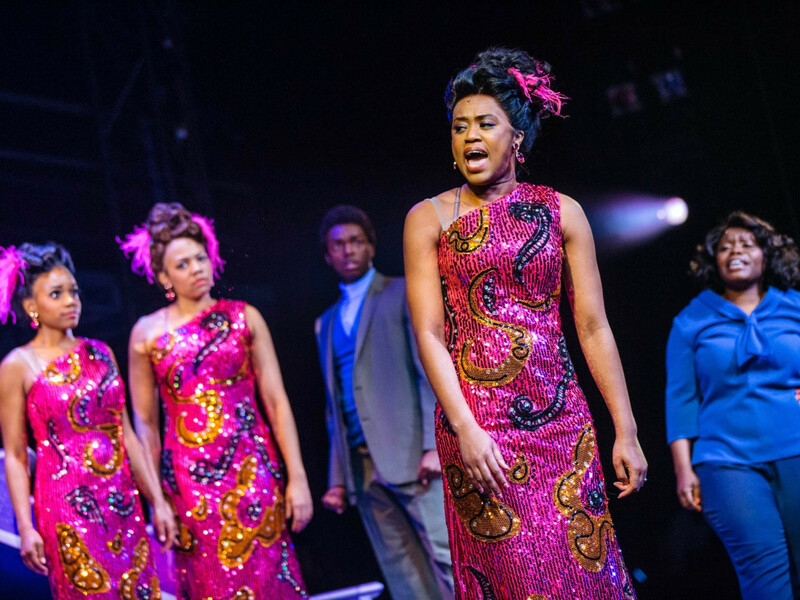 The Tony award-winning musical Dreamgirls always thrills and entertains with its story of rising-star divas’ heartache and backstage backstabbing amid Motown-esque music of the '60s and '70s. But the new Theatre Under the Stars production directed by Sheldon Epps (who held the TUTS artistic advisor title for most of this season) goes beyond a fun night at the Hobby Center. 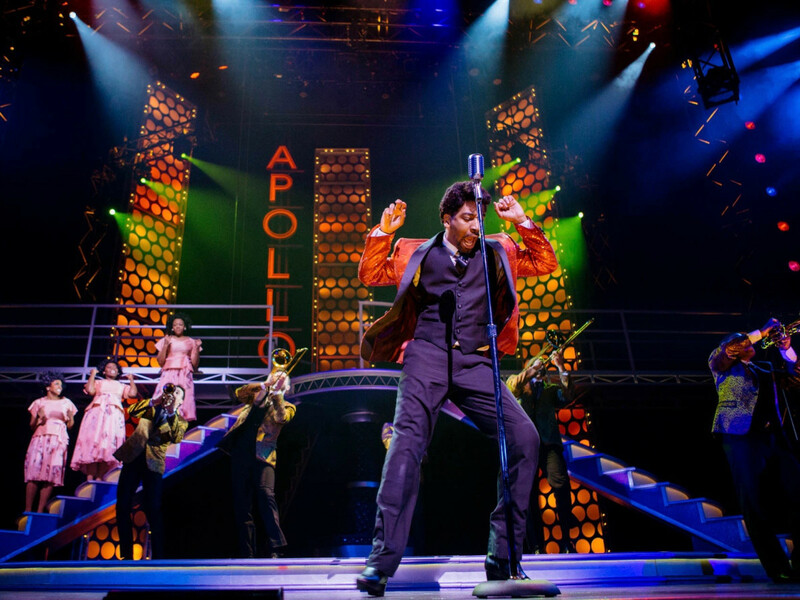 This revival also spotlights a question beating at the musical heart of the show: What do we do when our dreams become delusions preventing us from growing and changing? 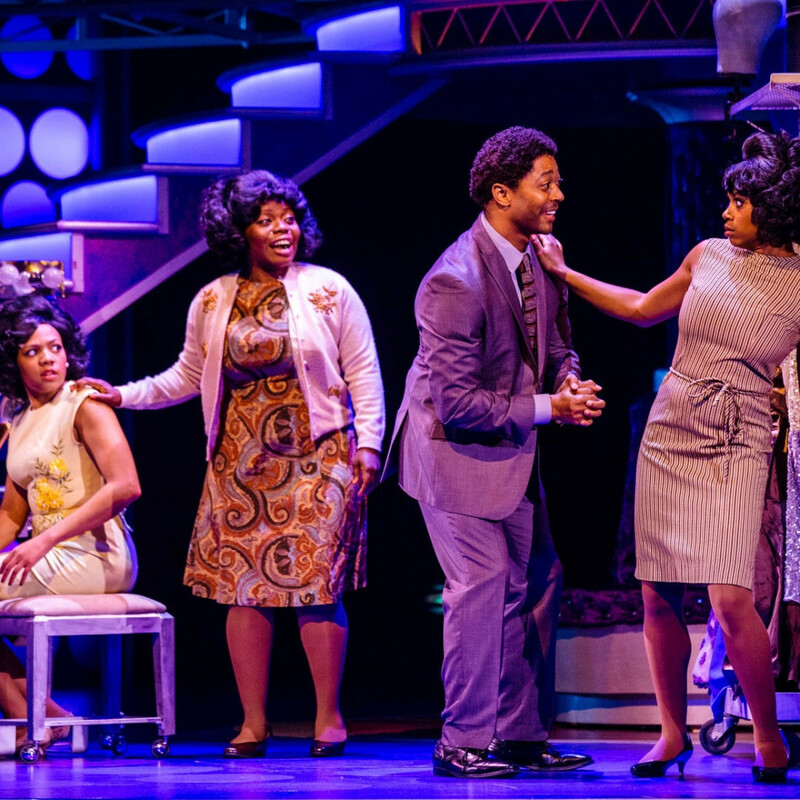 When it debuted on Broadway in the early '80s, with book and lyrics by Tom Eyen and music by Henry Krieger, the story of a '60s R&B girl group that loosely resembles the Supremes or Shirelles quickly, and unsurprisingly, collected multiple Tony and Grammy Awards. If we’re looking for a glorious show about showbiz, well this new TUTS production has all the dazzling gowns (from costume designer Colleen Grady), fantastic wig changes and soaring music we could want. Yet, the Epps-directed cast also manages nuanced and sometimes deeply sad portrayals of that all-too-human capacity for self-delusion. Every character in the show has a dream, while also becoming, sometimes uninvitedly, someone else’s object of dreaming. 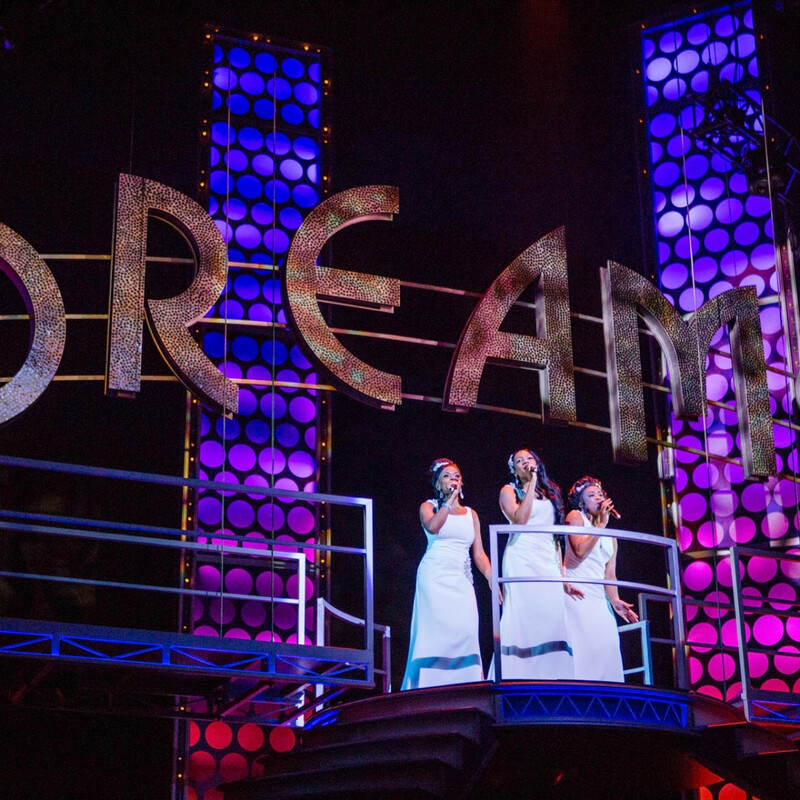 The young Dreamgirls — Effie White (Zonya Love), Deena Jones (Phoenix Best), and Lorrell Robinson (Ta’Nika Gibson) — dream of musical stardom, and if they can find it, the love of a good man. 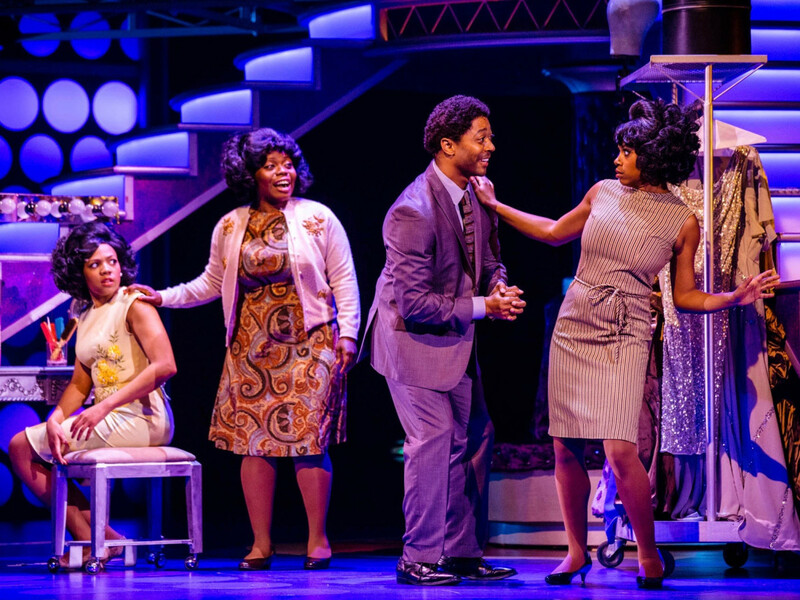 Car salesman, Curtis Taylor Jr. (Thomas Hobson) is indeed a bad man, but when he arrives in their lives, prowling the backstage of the Apollo Theater, searching for talent to tame and therefore a way into the music business, he becomes the answer to all the girls’ dreaming. 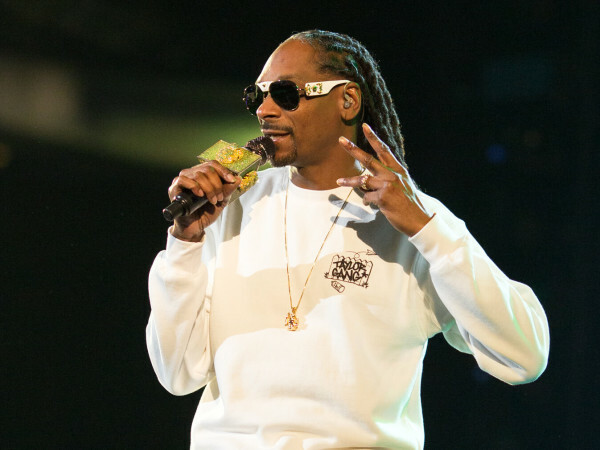 As their manager, he molds them into a hit-making act that can cross over into the white -dominated pop charts. At the same time, first for Effie and then Deena, he also appears to be that romantic dream man who will give each woman love. Hobson could have played Curtis as a genius con man bent on becoming the music business mogul any way he can, but in numbers like “Steppin to the Bad Side” and “When I First Saw You,” he creates a man who has conned himself, buying into his own hype. Curtis believes he can hold unto unlimited control over his musical dominion and keep forever his dream woman, Deena, who he never truly sees as a real flesh-and-blood human being. Taken out of the context of the musical, the song feels like an anthem of female empowerment, but if listeners really hear the lyrics and know where the song falls in Effie’s story, we realize this song is about delusions, not beautiful dreams. And in this TUTS production, as Love sends those final “You’re gonna love me” notes flying into the balcony seats and beyond, she also lays her character figuratively down into the dirt and reminds us what this song is really about, the loss of almost everything Effie possesses, including self-respect. 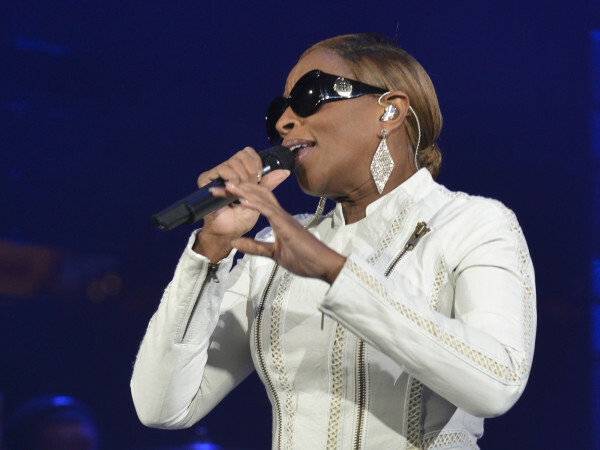 This wrenching rendition of “I’m Not Going” makes her second act song “I Am Changing” into the real anthem of the show, and thereafter a sign of which characters will give up their illusions in order to survive, change and thrive and which will not. Among those making those choices to be true to self or the fiction of showbiz is Jimmy “Thunder” Early. As played by E. Clayton Cornelious, Jimmy tends to walk (dance, sing and, for a few too brief seconds, twerk) away with pretty much every scene he’s in. He brings pure joy to the show even when also losing his career after rebelling against Curtis’s constant rebranding of his image to make him more palatable for '70s white record buyers. 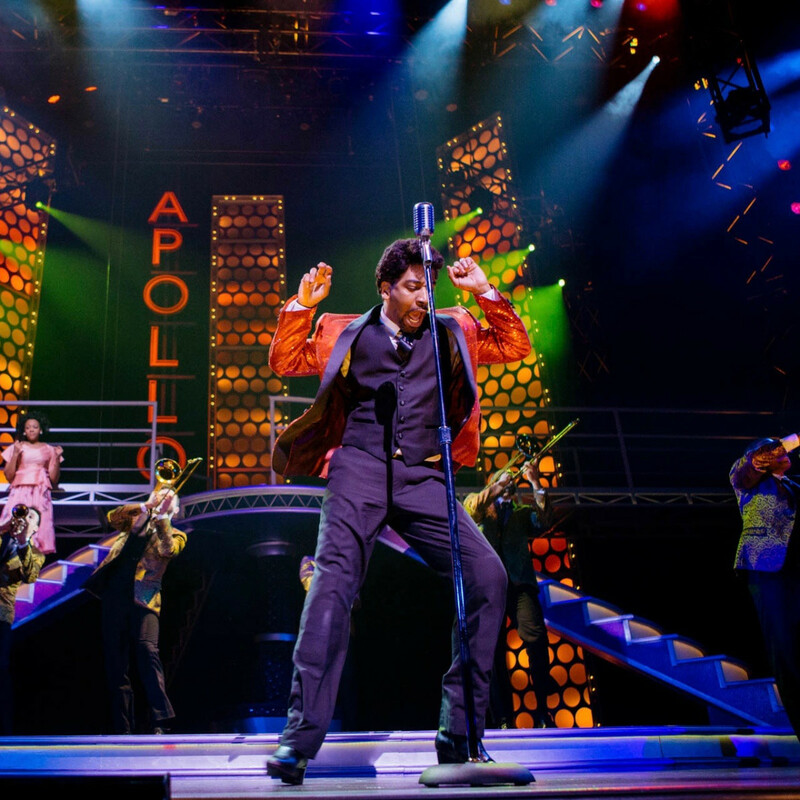 With almost all the dialogue in the show sung, the constant movement and driving pace set by Epps and choreographer Jeffrey Polk seem appropriate. Even scenic designer Kevin Depinet’s giant staircase at the center of the set rotates three separate staircases as a kind of ever-revolving stair wheel. The Dreams' and Jimmy’s constant, and dramatically lit, climbs up and down the stairs as their stardom rises and falls might be a little too on the nose, but I perhaps I shouldn't fault the creative crew for running a metaphor into the sky, instead of the ground. 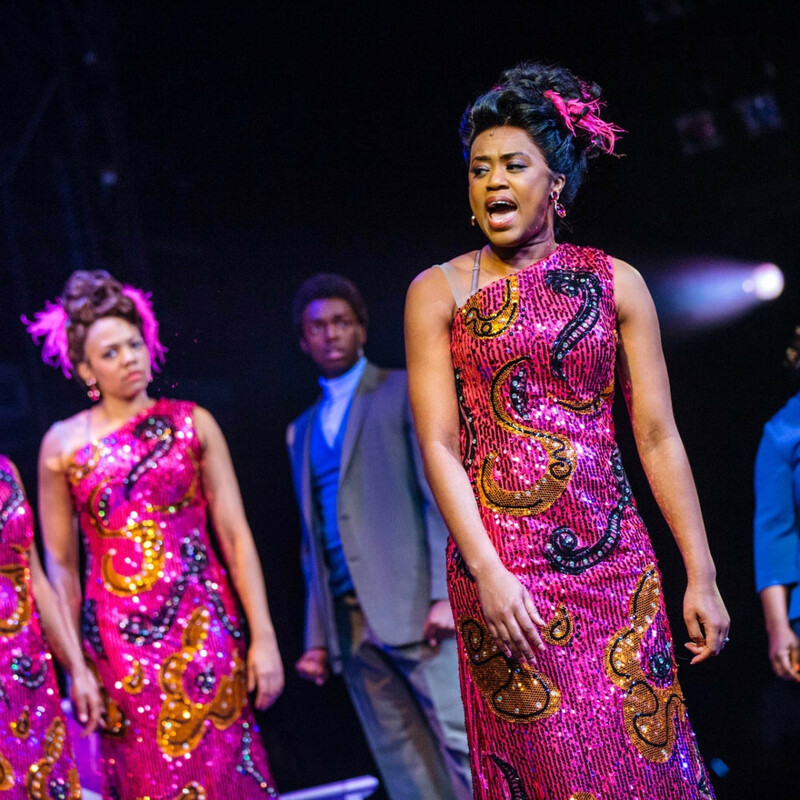 By the end, this back-to-emotional-basics Dreamgirls retains all the beauty of a dream, but also wakes us up to the power of facing reality in order to regain our soul’s music. 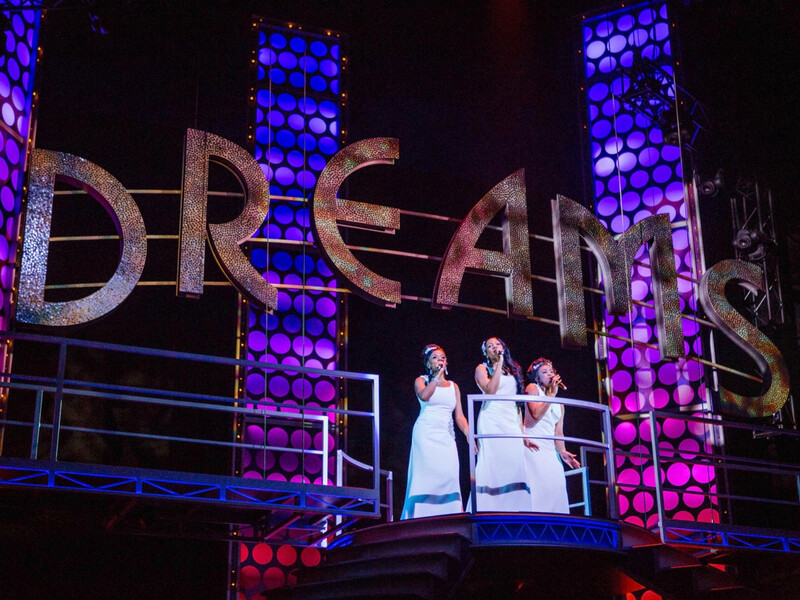 Dreamgirls runs through April 16 at the Hobby Center. For more information visit the Theatre Under The Stars website.